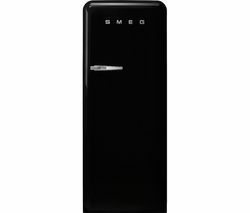 A Smeg fridge is one of the most stylish fridges available. If you want to make a statement in your kitchen, choose a colourful upright Smeg fridge from their classic 1950’s-style retro range and give your kitchen a touch of wow factor. Smeg fridges are stylish and will complement any kitchen, and while each Smeg fridge is designed to look amazing, they never compromise on performance, so your groceries will always be kept at the right temperature to keep them fresh for longer. These tall fridges from Smeg are playful, and come in a range of colours including retro pastel shades, bold primary colours and striking patterns that you will enjoy seeing in your kitchen. Smeg fridges are as practical as they are stylish and feature plenty of room inside for all your fresh food. They also feature a convenient automatic defrosting function which means you won’t ever have to defrost your Smeg fridge and the fast chill function quickly gets recently stored groceries to the optimum temperature. If you’re looking for a stylish fridge to complete the look of your kitchen, check out the colourful range of 1950’s inspired Smeg fridges and you’re sure to find the ideal appliance. 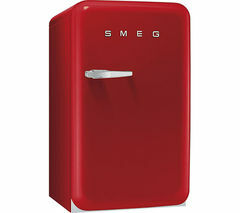 Smeg also offer a fantastic range of fridge freezers for all your refrigeration needs.